ERRATUM: Woops. I made a great big error on the launch vehicle for Galileo -- it was, in fact, the Shuttle. Thanks to Bruce Moomaw for the correction below! My last podcast for 365 Days of Astronomy aired over the weekend: "Galileo and the Moons of Jupiter" pointed out that Galileo, the scientist, discovered the Galilean satellites of Jupiter four hundred years ago next month, while Galileo, the mission, arrived at Jupiter to study those moons in situ fourteen years ago Sunday. But it's actually not my last podcast, because they announced last week that 365 Days of Astronomy is going to continue into 2010! If you didn't get a chance to contribute in 2009, now's your chance to grab a date or two for next year. There were not a lot of people talking about the planets in 2009, so I'd like to encourage you readers to jump in and talk about some of your favorite destinations or favorite robotic missions across the solar system. And now here's the transcript for Sunday's show. Four hundred years ago, the five bright wanderers in the night sky were solitary travelers, tracing their paths out among the stars. Then, in January of 1610, Galileo pointed his telescope at one of them, Jupiter, and discovered that it was attended in space by four other, fainter stars. In his honor we now call those four moons the Galilean satellites of Jupiter. Studying these four moons was one of the primary goals of Galileo's namesake spacecraft, which arrived at Jupiter fourteen years ago tomorrow, on December 7, 1995. I'm Emily Lakdawalla, from The Planetary Society, and I'm here to tell you about the treasures that the Galileo space mission returned to us from the Galilean moons. We were lucky that the spacecraft returned any data at all; the many delays to Galileo's launch resulted in a technological glitch that was nearly catastrophic to the mission. The spacecraft launched seven years later than planned, on October 18, 1989. A year and a half later, after Galileo had flown past Venus and Earth for gravity assists, its engineers attempted to deploy the four-point-six-meter-diameter dish antenna. The antenna had to fold in this way in order for the spacecraft to fit within the Space Shuttle's cargo bay for launch. After the Challenger disaster, no further science spacecraft were launched from the Shuttle, but the Galileo antenna had not been redesigned to reflect the change in launch vehicle. Woops. This was totally wrong. Thanks to Bruce Moomaw for the following correction: "Not only was Galileo launched by Shuttle, but so were Magellan, Hubble, Ulysses, the Gamma Ray Observatory, the Upper Atmosphere Research Satellite, Chandra, a LAGEOS geodetic satellite and the ESA's EURECA experiment carrier (which was retrieved by a Shuttle a year later). And Galileo's high-gain antenna failure was caused by a far subtler slip-up: the failure of engineers to take into account the vibrations the craft underwent when it was shipped by truck rather than by air back to California following the cancellation of its planned May 1986 Shuttle launch after the Challenger disaster, and then shipped back to Florida again by truck prior to its final Shuttle launch in Oct. 1989. These removed some of the powdered lubricant spread on the tips of the antenna ribs where they were tucked into sockets on the central mast." Galileo flew by Gaspra on October 29, 1991. 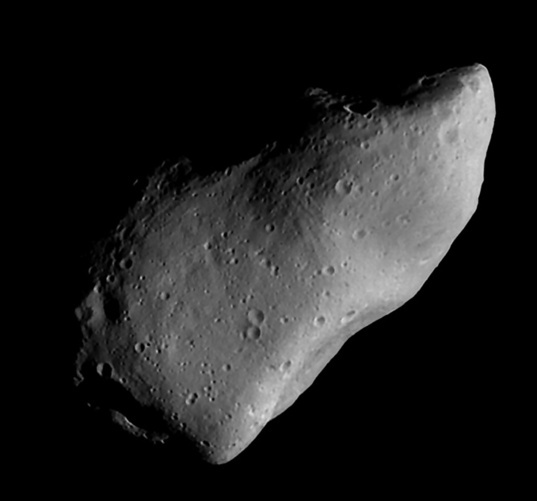 Gaspra is an S-type asteroid about 19 x 12 x 11 kilometers in size. Gaspra is reminiscent of Mars' moon Phobos, having many craters and occasional grooves. This would prove to be a fateful decision, because the Galileo antenna deployment failed. Three of the umbrella's ribs were stuck to the antenna's central tower. Over the next two years, as Galileo continued its long cruise, encountered an asteroid named Gaspra, and flew past Earth a second time, engineers tried increasingly desperate measures to loosen the stuck ribs. They tried running the antenna through extremes of temperature, warming and cooling the spacecraft while it was far from the Sun, in the asteroid belt. That didn't work. They tried the same technique again at Galileo's closest approach to the Sun, when it was hottest. That didn't work. Finally they tried an aggressive approach, hammering the deployment mechanism. That didn't work. In early 1993, the efforts to solve the antenna problem were deemed a failure. So Galileo would have to accomplish its mission to study Jupiter and its moons without a high-gain antenna. The huge dish would have permitted Galileo to return data at up to 134 kilobits per second. The high-gain antenna would have broadcast the radio's transmissions out of a very narrow cone only 1/3 of a degree across. Like all spacecraft, Galileo was also equipped with a low-gain pole antenna that does not need to be pointed so precisely, because its transmission cone is a wide 240 degrees. But spreading the transmitter's power over such a large area meant that it could only achieve transmission rates of at most 80 bits per second, much less than a tenth of a percent of the rate of the high-gain antenna. And most of the time, the actual transmission rate was 10 bits per second. The Galileo mission would continue, but it would have to be redesigned completely. Galileo had been intended to return much of its data in real time, communicating with Earth while it studied Jupiter and its moons. Only during rare occasions would it record data onto a four-track reel-to-reel tape recorder for later playback. At 10 bits per second, it was no longer possible to do real time data playback; all science data would have to be squeezed onto the 100-Megabyte tape recorder and saved for later playback. Galileo's orbits of Jupiter were long and elliptical. Each orbit lasted one to two months. Each orbit typically included one close flyby of one of the four Galilean moons. Science observations were planned for the week around Galileo's closest approach, packing the tape recorder to its limit and then during the rest of the orbit, Galileo would roll slowly forward through each tape track, reading the data into memory, and feeding that data bit by painful bit to the transmitter, sending 10 bits to Earth each second. The biggest loss to science from the redesign of the mission was that Galileo would not be able to take long series of images on Jupiter to monitor the motions of its clouds. But the redesigned mission was able to do almost as much at the Galilean moons as had been originally planned. Most of the time, Galileo's orbit took it very far from these moons, but targeted encounters brought it within about 3000 kilometers of their surfaces. Galileo tape-recorded images and other data that it took during the brief periods around these targeted flybys. In all, there were twenty-nine successful moon flybys. This view of the anti-Jovian hemisphere of Io was captured by Galileo on February 20, 1997, on its "E6" orbit. The volcano named Prometheus, which has been erupting continuously since Voyager flew past, is in the center of the disk, with a curl of black lava exiting to its right. The four moons have distinctly different personalities. The innermost, Io, is pockmarked with volcanoes, a handful of which are always erupting, spewing forth fountains of cinders and gas and coating its surface with brightly colored sulfur-rich ashes. Next out is the smallest of the four, Europa, whose bright icy surface is criscrossed by paired ridges and dotted with reddish spots. Next is Ganymede, the largest moon in the solar system, bigger even than Mercury, a brown world covered with plates of ancient, cratered terrain that are carved into pieces by grooved lanes of disrupted ice. Finally, there's black Callisto, whose ancient icy crust is almost completely coated in dark dust. On the very first flyby, of Ganymede, Galileo discovered that the giant moon had its own internally generated magnetic field, meaning that it likely has a liquid iron-rich core, much like Earth. Later on, Galileo discovered that on top of the internal magnetic field, there's also a magnetic field induced by Jupiter, which tells us that Ganymede may have a subsurface water ocean, like its more famously watery neighbor Europa. Scientists found that the grooved terrain could be erased that Ganymede's plates reconstructed in their original positions, but confusingly, no evidence has yet been found for places where Ganymede crust gets consumed. From Europa, Galileo returned startling images of terrain that looked like broken up pack ice from Earth's Arctic. By analogy, it would seem that Europa's icy crust had somehow melted all the way through in places, then refrozen with the blocks of ice tilted in place. Actually, though, the similarity to Earth pack ice is misleading. The surface of Europa is incredibly cold, at its warmest a hundred and sixty degrees below zero Celsius. At such a cold temperature, water ice behaves like rock does on Earth. The only liquid water at Europa must be deep below the surface, where it's warmer; any liquid that might erupt on to the surface would be like molten lava on Earth, quick to cool and solidify. The idea that a large area of Europa could melt through to the surface just doesn't work. Somehow, these broken-ice features must form with the ice remaining solid. Equally fascinating are the double ridges that criscross Europa's surface. By careful mapping of much of the tiny moon, planetary geologists discovered that many of these ridges mark locations where crustal plates slid past each other in so-called strike-slip motion, the same kind of motion that happens across California's San Andreas Fault. Europa is alternately squeezed and stretched by tidal interactions among the moons and Jupiter, and the double ridges are built up as Europa's crustal plates slide back and forth, rubbing against each other, breaking up and warming the ice. From a distance, Europa is the smoothest body in the solar system, with hardly any topography disturbing its cue-ball outline. But locally, across these ridges, the terrain on Europa is shockingly rough. No ice skating would be possible there; it'd be ice climbing, clambering from ridge top through crevasse bottom across a fractured landscape of rock-hard, bright ice. Europa's surface proved so intriguing, and so rich a source of clues as to what may be going on deep inside it, that most of Galileo's first extended mission was devoted to flybys of this smallest of Jupiter's Galilean moons. By contrast, Callisto seems far less interesting than Europa or Ganymede. The high density of craters on its surface suggest that nothing much has happened there since the birth of the solar system. But the images that Galileo returned from its close encounters with Callisto showed that something was eating away at the rims and peaks of those craters -- as though Callisto wasn't just geologically dead, it was decomposing. Scientists eventually figured out that a process called runaway thermal segregation was causing the strange erosion. When the feeble rays of the Sun warmed the surface ice, a few molecules here and there escape into the tenuous atmosphere on Callisto. Eventually, they settle back to the surface, but they're more likely to solidify on colder spots than brighter spots. Where the surface was slightly darkened by the presence of a little dust, it warmed more than the bright icy spots, so there was a net transport of water molecules from warm dark areas to cold, bright areas. Each time water molecules left a dark areas, they left behind a higher proportion of dust. Over time, this left Callisto a mostly dark, dusty surface, like the ugly lag deposit of street grime that accumulates on roadside snowbanks, with a few scattered peaks of bright, clean ice here and there. This same process later turned out to be the solution to a four hundred year old mystery in a different part of the solar system, explaining the dichotomy between the bright and dark hemispheres of Saturn's two-faced moon Iapetus. 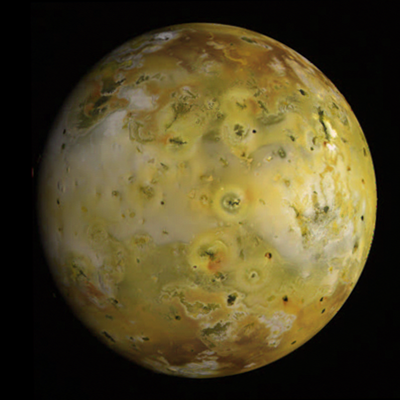 Close study of the volcanic moon Io was saved for late in Galileo's mission, because of the hazardous environment so deep within Jupiter's powerful radiation belts. In order to have any hope of returning science data from Io, the software that controlled Galileo's autonomous reactions to possibly dangerous errors had to be rewritten to be more accepting of the kinds of problems generated by high-speed protons colliding with the spacecraft's processors, degrading electronics, and flipping random bits within the control software. But Galileo made discoveries even before these close encounters, observing surface changes in the patterns of bright volcanic deposits in the fifteen years that had passed since the Voyager flybys. Close encounter images revealed that Io's mountains weren't only volcanic; there were also regions of steeply faulted mountains. Galileo also observed lakes of molten lava and fountains of fiery liquid rock gushing a thousand meters into the sky above a caldera named Tvashtar. Galileo's last flyby of Io, in 2002, was within only 100 kilometers of the surface, and set the spacecraft up for its eventual death. On its next orbit, its orbit periapsis was within Jupiter's atmosphere, and the spacecraft burned into oblivion, its atoms merging with Jupiter's clouds. The battle-scarred spacecraft had operated three times longer than its originally planned mission, and survived exposure to more than three times the radiation it had been designed to withstand. A generation of young scientists grew up on the treasure trove of data relayed slowly and laboriously through that low-gain antenna at a painful 10 bits per second. Those scientists are now applying the theories developed on Galileo's Jupiter results to the much larger store of data from the Cassini mission to Saturn. Some of those theories are passing muster, while others don't seem to translate to Saturn. Cassini's mission has already lasted more than five years, and may continue for five more, or even longer. The community of outer planets scientists has to hope that Cassini will last a very long time, because the next mission that will be able to perform in-depth study of the moons of an outer planet will not even launch for at least a decade. The successor to Galileo and Cassini, a joint American and European project known as called the Europa Jupiter System Mission, currently exists only on paper, and is only the latest in a series of proposed future Europa missions, all previous incarnations of which have been canceled. Such a mission faces numerous hurdles, but the greatest one is cost; it just can't be done for under three billion dollars, and would be done best at a price of four, five, or even six billion. Is it worth it to you to spend so much to study this solar-system-within-a-solar system? If you think it is, write your elected representative and tell them so. While we wait for the next mission, there are still discoveries to be made within the Galileo data set. I write about missions old and new at The Planetary Society's blog at planetary dot org slash blog. Check in regularly to see fantastic views of the surprising and strange landscapes to be found across the solar system. Thank you for listening.